New Coles Little Explorer nappies - we challenge you to join the Big Nappy Change! New Coles Little Explorer nappies – we challenge you to join the Big Nappy Change! If you fancy a quality nappy at an affordable, family budget friendly price, it’s the perfect time to join The Big Nappy Change challenge! To be part of the Big Nappy Change challenge it couldn’t be easier, all you need to do is switch out your current nappy brand for just five days and try the all NEW Coles Little Explorer nappies, where every nappy in the pack is as reliable as the next and loaded with extras! How can a simple nappy be loaded with extras you might ask, for starters Coles Little Explorer nappies have a Dry-tech ultra absorbent core that keeps baby’s delicate skin dry and healthy by wicking away moisture in addition to delivering maximum leakage protection, which we parents all dread. Secondly, No more buying one packet of nappies for your daughter and another for your son – Coles Little Explorer nappies are completely unisex (hooray!) thanks to their awesome contoured design that’s designed to fit your baby’s body and protect against leakage both day and night. A feature that absolutely must be mentioned is showcased in the Coles Little Explorer newborn nappies, it’s the unique front panel design that provides space to accommodate your precious new bundle’s umbilical cord clip and minimise belly button rubbing and soreness. And that’s not all – a super handy wetness indicator is featured on both the Coles Little Explorer newborn and infant sizes, a star pattern colour fades when wet to indicate when a nappy change is needed. A superb addition to the hospital bag for pending arrivals and the perfect option for new parents who are new to wrangling a tiny newborn’s nappy changing routine! Not only do Coles Little Explorer nappies fit both the littlest of ladies and lads, their contoured fit is combined with a three way active fit. A stretchy waistband , soft elasticised leg cuffs and stretchy resealable side tabs are designed to ensure your little one stays comfortable during play, while preventing leakage. It’s safe to say with new experiences everyday, Coles Little Explorer nappies has your little one covered at every turn – including a breathable quilted nappy surface and a super soft inner lining to help reduce any redness and chafing in its job of protecting sensitive and delicate skin. We think Coles Little Explorer nappies are right up there in quality and performance when compared to favoured brands of families found in nurseries and nappy bags across Australia. Why not take up the Big Nappy Change challenge – for just five days, trial Coles Little Explorer nappies in your home and experience for yourself a great quality nappy at an exceptional family friendly price point. 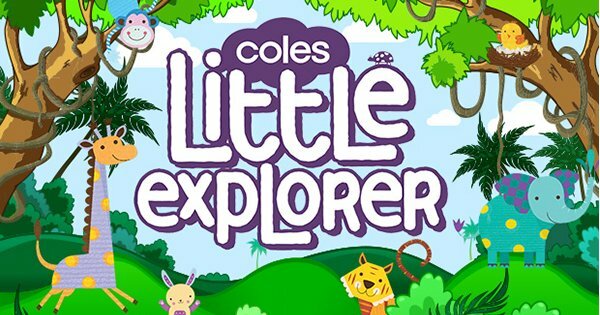 Coles Little Explorer nappies are available in the following sizes: newborn (up to 5kg), infant (4-18kg), crawler (6-11kg), toddler (10-15kg), walker (13-18kg) and junior (16kg+). All sizes can be found in Coles supermarkets around the country and priced a very affordable $9.99 a packet.